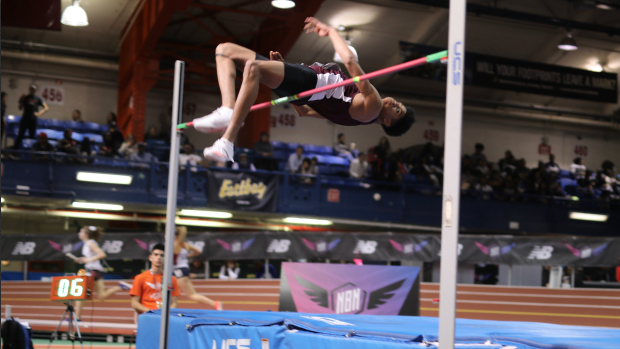 The Handley teammates came to New York for medals and left with two medals and two All-American finishes. Taylor Beard began the weekend on Friday with a 4th place finish in the girls' high jump and Trey Causey followed suit on Saturday with his 2nd place National Runner-up finish. Beard ultimately cleared 5-7 for her All-American finish. That was 1.70 in metric measurements. She did not miss a jump until 5-8.75. Causey on the other hand jumped a VA #5 all-time mark of 7-00.25 to finish second. That was 2.14 meters. His profession was clearing opening height, missing 1.96 meters once and then clearing everything until 7-00.25 on his first attempt. On that all-important mark he was able to clear the cross bar on his second attempt. That was his first clearance over the seven foot barrier.